Bloomsbury, 2006. 362 Pgs. Nonfiction. The title of this book refers to a tree in the backyard of a home in Ramla, Israel. The home is currently owned by Dalia, a Jewish woman whose family of Holocaust survivors emigrated from Bulgaria. But before Israel gained its independence in 1948, the house was owned by the Palestinian family of Bashir, who meets Dalia when he returns to see his family home after the Six-Day War of 1967. The author traces the history of the Israeli-Palestinian conflict through the parallel personal histories of Dalia and Bashir and their families. Dalia struggles with her Israeli identity, and Bashir struggles with decades in Israeli prisons for suspected terrorist activities. As they follow Dalia and Bashir's difficult friendship, readers will experience one of the world's most stubborn conflicts firsthand. 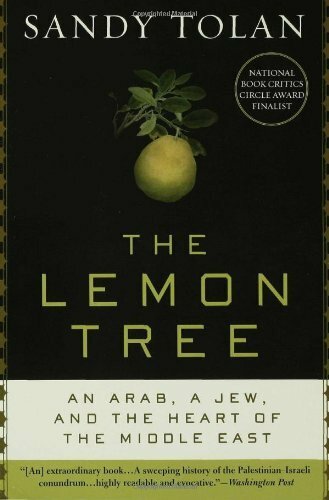 I really liked the fact that this book is structured around the story of two individuals, because the history of the Middle East is so complex that it is easy to get bogged down in the details and confused by the dates. Having two people to follow helps everything make more sense and kept me reading through to the end. The author stresses the fact that the book is based on hours of interviews and research, and includes extensive notes in the back to back this up; he also is striving to provide a balance between both points of view, Palestinian and Jewish, which meant it was much easier to get a sense of the whole picture rather than just part of it. I would recommend this book for anyone trying to understand the recent history of Israel.